The stream, known as the Kirkebrok (Church Brook) these days just appears out of a pipe. At the time of writing this guide, I am unable to state its starting point although it is believed that Dove Mill lodge is also in its path. It is also thought to travel under Kirkebrock Road and under a grating to the side/rear of the Co-operative store near Hulton Lane. 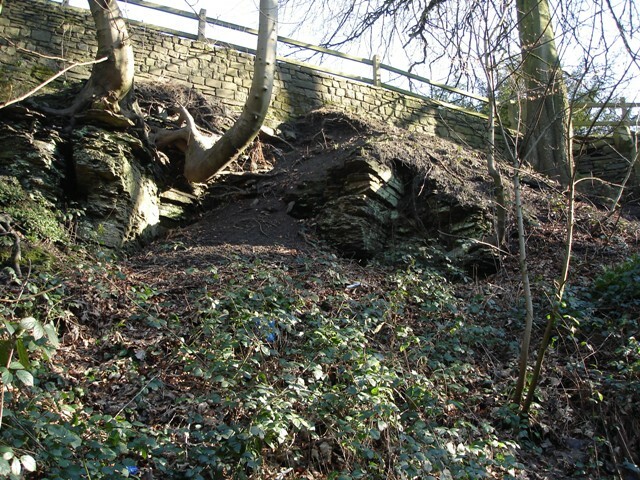 There is a piece of folklore which says the cave in the Clough wall goes all the way to the Town Hall. In fact, it only goes a few yards. It was bricked up many years ago for safety reasons. Discovered while looking through archives at Bolton Museum is this reference. 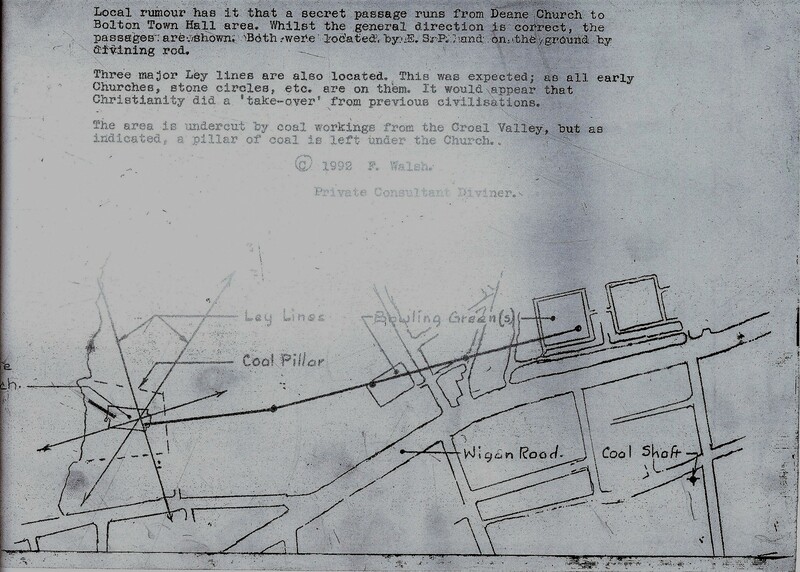 Local rumour has it that a secret passage runs from Deane Church to Bolton Town Hall area. Whilst the general direction is correct, the passages are shown. Both were located by E.S.P. and on the ground by divining rod. Three major Ley lines are also located. This was expected; as all early Churches, stone circles, etc. are on them. It would appear that Christianity did a 'take-over' from previous civilisations.The area is undercut by coal workings from the Croal Valley, but as indicated, a pillar of coal is left under the Church. © 1992 F. Walsh Private Consultant Diviner"
More pictures of the Clough here.